This time I would like to introduce some special swords called “Ryûkyûan swords” (Ryûkyû-tô, 琉球刀; from now on quoted without macrons except for terms in Japanese) which are usually left out in the relevant sources, mostly because of the fact that they are such an absolute rarity. But why are Ryukyuan sword so rare? Reason number one lies not that far back: It was the destruction and confiscation of all weapons by the American troops during the attacks on the Ryukyu island in the last year of the Pacific War. And reason number two is the disarmament of local Ryukyuan warriors and a weapons ban which took place several times in history. To understand the special circumstances around Ryukyuan swords and Japan’s foreign trade loophole mentioned in the headline, we have to go back to the 14th century, but before that, it takes a short excursion into geography. The Ryukyu Islands are a chain of islands that stretch southwest from Kyushu to Taiwan. 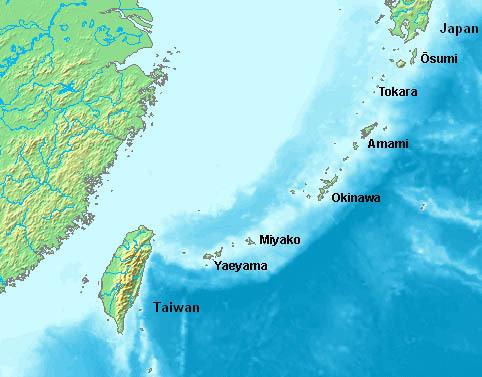 They basically consists of six larger islands or archipelagos, namely from north to south of Ôsumi (大隅), Tokara (吐喝喇), Amami (奄美), Okinawa (沖縄), Miyako (宮古), and Yaeyama (八重山). Picture 1: The Ryûkyû Islands. The Ryukyu Kingdom (Ryûkyû-ôkoku, 琉球王国) had its origins on the largest of the Ryukyu Islands, Okinawa, which consisted until the 14th century subsequently of smaller feudal domains and three major kingdoms – Hokuzan (北山), Chûzan (中山), and Nanzan (南山) – which were unified by the king of Chûzan, Shô Hashi (尚巴志, 1371-1439), in 1429. Incidentally, the oldest evidence of human existence on the Ryukyu Islands is from Stone Age and written reports on Ryukyuan inhabitants go back to the 7th century AD, but as we are focusing on the Ryukyu Kingdom, I want to leave out the early history of the islands. Before the unification, Shô Hashi had been the king of Chûzan and had strengthened the connections to Ming China to which Chûzan was tributary. Japan had used Okinawa and Amami as bases during some of the 8th century missions to Tang-China but we know that the islands had continuous contact with both Japan and China over the subsequent centuries. However, Shô Hashi’s policy marked a noticeable shift towards China. Another main policy of him was to expand trade, not only with Ming China but with other Asian countries as well. The strong bonds with China become especially evident when the Ryukyu court send emissaries to the Ming court and not to the Ashikaga-bakufu to ask for the investiture of Shô Hashi’s son after Hashi’s death. Picture 2: Page from the Rekidai Hôan. Before Shô Hashi’s regency, Ming China had sent three imperial diplomatic missions to Chûzan, i.e. to Okinawa, namely in 1372, 1404, and 1415. Twelve more followed until the end of the 16th century. So the tributary relationship to China was the motor of the Ryukyu Kingdom being now a key player in maritine trade with Southeast and East Asia. 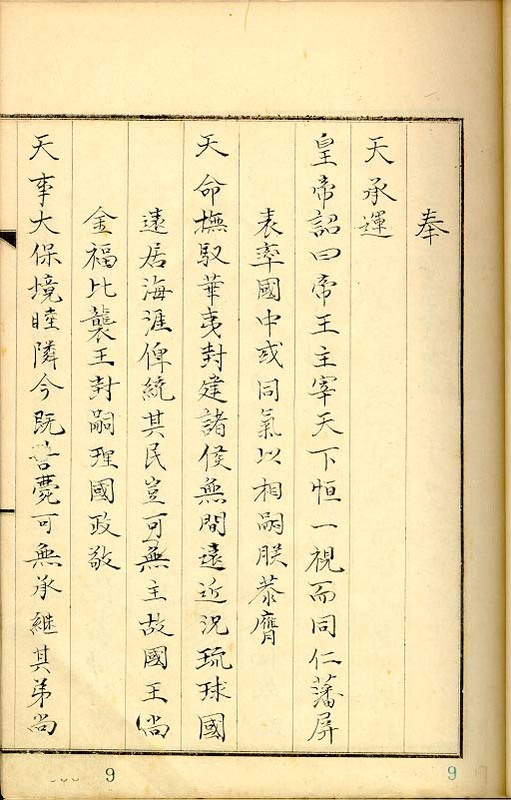 The Rekidai Hôan (歴代宝案), an official compilation of diplomatic documents of the Ryukyu Kingdom covering the period from 1424 to 1867, contains records of communications and trade between Ryukyu and ten different trading partners. The ten countries were China, Korea, Siam, Malacca, Palembang, Java, Sumatra, Pattani, and Jakarta. I have written here about the Japanese sword trade with Ming China so the questions are: Did the Ryukyu Kingdom just act as transshipment point for Japanese swords, i.e. was Ryukyu just another way via which the same Japanese swords were exported to Ming China? Or were there special, peculiar swords exported from Ryukyu and by the Ryukyu Kingdom itself? One indication of the assumption that the Chinese distinguished between Japanese swords and Ryukyuan swords is that there are both Nihontô no uta (日本刀歌), Odes to the Japanese Sword, and Ryûkyû-tô no uta (琉球刀歌), Odes to the Ryukyuan Sword, extant from Chinese poets. For example, two known Odes to the Ryukyuan Sword go back to the Ming Chinese painter and poet Xú Wèi (徐渭, 1521-1593), and one to the Qing Chinese painter and poet Zhāng Wèntáo (張問陶, 1764-1814). However, from the late Ming to the early Qing Dynasty, i.e. in the mid-17th century, China experienced a boom in such sword odes and in several cases, the term Ryûkyû-tô was used synonymously with Nihontô. Therefore and because of the pretty identical content of both odes, some experts assume that the differentiation was just made on the basis of from where the swords were imported. Anyway, there are both Ryûkyû-tô no uta and Nihontô no uta extant from Xú Wèi and Zhāng Wèntáo. Indications for the assumption that Ryukyuan swords were special and not just forwarded from Japan are found in the Rekidai Hôan. At this point I have to point out that with “special,” the sword mountings are meant, because experts agree that the blades of Ryukyuan swords were solely made by Japanese smiths. So in the Rekidai Hôan we read very often of swords with gilded scabbards or with scabbard and/or hilts with mother-of-pearl (raden, 螺鈿) ornamentation. Mother-of-pearl and the inlay of seashells is a very characteristic feature of Ryukyuan lacquerware. On the basis of these descriptions and the very few extant Ryûkyû-tô it seems that the blades and certain sword fittings like tsuba, fuchi, kojiri, and maybe even kozuka and kôgai if present, were imported from Japan, and local craftsmen added the hilt, scabbard, menuki, and kashira; to add on the ond hand the special “Ryukyuan touch,” and to comply on the other hand with the taste of the Chinese and Southeast Asian customers. Some assume that the Ryukyu Kingdom was the “contact point” for Chinese and Southeast Asian customers to order, in addition to Japanese swords, also customized swords which met more their taste and needs. There is namely no indigeneous Japanese production line known making directly on the ground “Chinese-style” swords ready for dispatch. Another possibility is that not sword blades and parts were ordered from Japan but that just a certain amount of the swords forwarded in the course of the trading with China and Southeast Asia were taken apart and remodelled by local Ryukyuan craftsmen. Or the Ryukyuan foreign trade office ordered, upon receiving custom orders from China, some more swords from Japan and those were locally remodelled and resold profitably. Before we continue I want to introduce the three most famous extant Ryukyuan swords to give you a better idea of what we are talking about. These three swords come from the artefacts of the Ryukyuan royal Shô family which are together designated as kokuhô. Sword number one (picture 3) is named Chiyoganemaru (千代金丸). According to tradition, the sword was once a hereditary treasure sword of the kings of Hokuzan and the last Hokuzan king Han’anchi (攀安知, ?-1416) committed seppuku with it when being defeated by Shô Hashi. To be more precise, Han’anchi got angry about not being able to defend his castle and so he cut at one of the castle’s sacred stones and as the sword possessed spiritual powers which should protect the king, it did not cut his belly and so he threw it into the near Shigema River (志慶間川) from which it was washed down, into the sea, and ashore of Iheya Island (伊平屋島) which is located to the north of Okinawa. The people of Iheya then presented it to the new king Shô Hashi. From that time on it formed, with the two swords described in the following, the treasure sword triumvirate of the Shô Dynasty until Shô Hiroshi (尚裕, 1918-1996), the great-grandson of the last king of the Ryukyuan Kingdom, presented it shortly before his death to the Okinawan city of Naha. The blade of the Chiyoganemaru is mumei and has a nagasa of 71.3 cm. It is in hira-zukuri, rather slender, and shows a pronounced sakizori. The jigane is an itame-nagare, the hamon a hiro-suguha-chô mixed with ko-gunome, ashi, and yô, and the bôshi is sugu with a rather pointed kaeri. Both sides show five narrow and parallel hi at the base. It is assumed that the nakago was altered for single-handed use and to add a Ryukyu-style koshirae and it is equipped with a riveted metal collar, an installment which is completely atypical for a nihontô. The blade is dated to the early Muromachi period which would support the tradition but no “official” attribution to a certain smith or school was done so far, at least not to my knowledge. The koshirae measures overall 92.1 cm and is dated somewhat later, namely to the Momoyama or early Edo period. Tsuba, koiguchi, and kojiri are thought to be of Japanese production but saya, menuki and the kabutsuchi no tachi-like pommel of local Ryukyuan manufacture. The tsuba is of shakudô, in mokkô-gata, shows each four inome and flower-shaped sukashi along the rim, and in between gilded chrysanthemums with kebori accentuations. The rim is highly raised and bears on the left side the kebori inscription “Tekanemaru/Teganemaru” (てかね丸). The exact meaning of this inscription is unknown but the Omoro Sôshi (おもろさうし), a compilation of ancient poems of songs from Okinawa and the Amami islands, contains a song titled Teganemaru no uta (てがねまる／手金丸の歌) from which we learn that the Teganemaru was a hereditary treasure sword whose other nickname was Tsukushi-jara (筑紫だら), a name in Okinawan dialect which means literally “large wakizashi from Tsukushi,” i.e. from Japan. So from this point of view, it seems that the name Teganemaru actually referred to the Chiganemaru, the sword which is described next. So either the tsuba had been switched, or the inscription was added later and the responsible craftsman just mixed up the nicknames of the two swords (which is quite possible as the names Chiyoganemaru and Chiganemaru sound pretty similar). Anyway, the uncommon pommel of the Chiyoganemaru is made of pure gold and shows carvings of chrysanthemums and the characters “Taisei” or “Ôyo” (大世) which are thought to refer to Shô Taikyû (尚泰久, 1415-1460), Shô Hashi’s fifth successor, whose posthumous divine name is Ôyo no nushi (大世主). Incidentally, there are records which suggest that the Chiyoganemaru was worn at each investiture ceremony of a Ryukyuan king. For detailed, zoomable pictures of the Chiyoganemru, click here. Sword number two is the Chiganemaru (治金丸). According to tradition, the chieftain Nakasone Toyomiya (仲宗根豊見親) of Miyako Island presented the sword and sacred beads in 1522 to the Ryukyuan king Shô Shin (尚真, 1465-1527) to congratulate him for subjugating the Yaeyama archipelago. Incidentally, a stele in Okinagwa’s Shuri Castle (首里城), the former royal palace of the Ryukyu Kingdom, was erected in 1543 in commemoration of this sword gift. The Chiganemaru is a wakizashi with a black-lacquer saya and both blade and koshirae, which measures 73.6 cm in overall length and which is about contemporary to those of the Chiyoganemaru, are thought to be of Japanese manufacture. However, the kozuka and hilt-wrapping seem to be of local origin. The tsuba is identically interpreted as the one of the Chiyoganemaru. Also identical are the two ô-seppa which, in both cases, might be made by a Ryukyuan craftsman. The blade has a nagasa of 53.8 cm and coms in hira-zukuri with sakizori. The jigane is itame, the hamon is a koshi no hiraita-gunome in nie-deki with togariba, and the bôshi is midare-komi with a maru-kaeri on the omote, and a pointed kaeri on the ura side. On both sides we find a futasuji-hi which runs with kaki-nagashi into the tang. The blade is mumei but thought to be a work of Ôei-Nobukuni (応永信国). So both koshirae are as mentioned later works and with the following tradition found in the Kyûyô (球陽), the authorized history of the Ryukyu Kingdom compiled in the mid-18th century, we can do some speculations on them. The Kyûyô states that king Shô Shin ordered Ahagon Jikki (阿波根実基), who is said to be the ancestor of Okinawan martial arts, to bring the Chiganemaru to Kyôto to have it repolished there. But when Jikki came to pick the finished blade up, the polisher gave him a counterfeit which Jikki unsuspectingly brought home to Ryukyu. But the fraud was discovered and Shô Shin ordered Ahagon Jikki once more to proceed to Kyôto to find the original treasure sword. It took him three years until he found and return it to Okinawa and because of this long stay, he changed his family name to Kyô-Ahagon (京阿波根). So it is possible that the Chiganemaru was newly mounted on this occasion and maybe the king himself or an official responsible for the royal swords ordered a local craftsman to equip the Chiyoganemaru with an identical tsuba. This would mean that one tsuba is of Japanese, and the other one of Ryukyan origin. Or Ahagon had the rediscovered Chiganemaru newly mounted on his own expense to remedy his fault of bringing back the wrong sword. Or his compensation was to present the king with a new and identical tsuba for the Chiyoganemaru which he paid for himself. Well, this is pure speculation but maybe the aforementioned inscription “Tekanemaru/Teganemaru” on the Chiyogane’s tsuba has something to do with this incident. Incidentally, the characters (手金, read as tekin) mean literally “deposit.” However, if both koshirae were made later, i.e. in the 17th century (experts’ opinions differ in this respect), than none of these speculations are true and the Chiganemaru was sent to Japan once more later. For detailed, zoomable pictures of the Chiganemru, click here. Sword number three is a koshigatana named Chatannakiri (北谷菜切). A legend says that the blade was once a kitchen knife of a farm woman from the Okinawan village of Chatan (北谷). One day when she was cooking, the knife autonomously cut off the head of her baby. The case was investigated and the woman charged but an official made a test and left the knife in the vicinity of a goat which head it cut off too. Upon this, the woman was released but the knife confiscated and forged into a dagger which was nicknamed “Chatannakiri,” lit. “vegetable cutter/knife from Chatan.” Another legend says that it came in the possession of the Shô in exchange for a paddy field in Chatan. Anyway, the koshirae is thought to be of local Ryukyu manufacture and is roughly dated like the other two to the 16th to 17th century. It measures 46.5 cm in length, has a saya covered with inlaid mother-of-pearl which features small square-shaped pieces of great turban shell, and a hilt with a golden uchidashi-same cover, that means the mounting is quite loud. It comes with a gilded kozuka and kôgai which are of noticeable inferior craftsmanship than for example contemporary Gotô works. The kozuka bears on the back the seal script character for ten (天, “heaven” or “imperial”) and the symbol for weight (fundô, 分銅). And the kôgai bears the same seal script character and a drum-shaped symbol. It is assumed that the character for ten is a mark to identify them as personal items of the Ryukyu King. The blade has a nagasa of 23.0 cm, is in hira-zukuri with a mitsu-mune and with a little sori. It lost much material (it remains to be seen if consciously altered or just often used) and shows thus only a hoso-suguha and lacks a bôshi. The jigane is itame which tends all over to nagare and the ura side shows a thin koshi-bi. Although not appraised, the blade is dated to the early Muromachi period. For detailed, zoomable pictures of the Chatannakiri, click here. Back to the sword trade. When we stay in the Muromachi period and check the entries of the Rekidai Hôan, we are far from the numbers of swords exported by the Japanese. The record from the 1425 trade with Ming China lists only 71 swords, and in the 1434 record we find 166 swords. In comparison, the Chinese court had by then limited the Japanese sword import to 3.000 tachi. And very interesting is that in most of the annual Ryukyuan trading reports we read of polishing stones being exported. For example, the 1428 report mentions “five different polishing stones” (wûyàng mó dao shí, 五様磨刀石) in the amount of altogether about 2.3 tons! The 1434 trade record mentions 3.8 tons of polishing stones so we can assume that everything was exported what was necessary from foundation to finishing polish. In other words, some Chinese customers or units were not only eager to resharpen their swords but also to bring back to a certain degree the beauty of the Japanese swords which was extolled in the aforementioned odes. As for the prices of these Ryukyuan swords, we learn from the 1434 trade record that the costs for one “royal ceremonial sword” (gûndao or Japanese kontô, 袞刀) of Ryukyuan manufacture was at that mission in average a little over 28 kan (貫). In comparison, the Japanese trade record from the 1432 mission states that the costs for one tachi were about 0.8~1 kan. So my conclusion is that the Ryukyuan sword trade with China was partly a very exclusive one. But what about the Ryukyuan ruling class itself? The Ryukyu Kingdom was composed of a complex caste system which was largely subdivided into royalty (ôji, 王子), scholar-officials (shizoku, 士族), and commoners (heimin, 平民). Enforcing law and providing military defense to the kingdom was put in the hands of the scholar-officials class which was subdivided into four ranks. The second highest shizoku rank, pechin (親雲上), was the one closest to the Japanese bushi class and by the 19th century, even the term samure was introduced to put the class literally on par with their Japanese counterpart. However, the scholar-official class was as the name suggests not a warrior-official class like in Japan. Depending on the historical phase of Ryukyu, the shizoku underwent somtimes more and sometimes less an official martial arts training. Also we know that the kingdom equipped all members of the royalty with swords and bestowed swords to shizoku when they served in the government ministry. That means it was not like Japan where each and every member of the ruling warrior class was equipped by default with a sword regardless of where he served and what his function was. So the Ryukyuan government model was more close to China and their scholars than to Japan. There are many questions remaining on how the fourteenth, fifteenth, and sixteenth century Ryukyuan ruling class was equipped but it seems that the majority of swords was imported from Japan and locally remodelled to a sword form similar to the Chiyoganemaru, i.e. sword intended for single-handed use with a short handle. And with these considerations, we are right back at the time when the Ryukyu Kingdom got again more connected with Japan. I have explained that the Ryukyu Kingdom was tributary to Ming China. When Hideyoshi asked king Shô Nei (尚寧, 1564-1620) to support his plans to conquer Korea, he refused, and he also refused later to formally submit to the newly founded Tokugawa-bakufu when being asked by the Shimazu, the lords of the Satsuma fief which was closest to Ryukyu. Thus the shogunate ordered the Shimazu in 1609 to invade the Ryukyus and the kingdom surrendered without armed resistance. As a result, the northern Amami archipelago was annexed by the Satsuma, the fief established suzerainty over the islands ruled so far by the Ryukyu Kingdom, and the kingdom was now officially a tributary vassal of the Satsuma fief, not the bakufu. But only seven years later, the initially strong Satsuma control was withdrawn and Shô Nei was given a great degree of autonomy. By the way, the Shimazu disarmed the Ryukyuan pechin and prohibited them of carrying of weapons but relaxed the prohibition a few years later so that pechin were able to travel with their personal swords to the smiths and polishers in Satsuma for maintenance and repair and the Ryukyuan royalty was still allowed to bestow swords upon their members. Thus it is assumed that swords were not confiscated but, except for ceremonies, wearing them in public was banned. Well, commoners were from now on no longer allowed to own swords. There was a simple reason for why the Satsuma control was withdrawn, namely profit. Ming China had prohibited trade with Japan in 1567 but the Tokugawa-bakufu realized that it was now again able to continue to maintain trade relations with China via the loophole Ryukyu Kingdom which was still tributarily connected to the Ming Dynasty. China namely would not make a formal trade agreement unless a country was a tributary state, which Japan wasn’t at that time. And eleven years after the Qing Dynasty had replaced the Ming Dynasty in 1644, the Tokugawa-bakufu of course also formally approved the tribute relations between the Ryukyu Kingdom and Qing China. So when Japan had cut off trade relations with Europe except for the Dutch, Ryukyu became (apart from Nagasaki) the only connection with the outside world. But with this situation, there was now always the danger that Chinese officials found out about how much control Japan in general and the Satsuma fief in particular had over the Ryukyu Kingdom, with the consequence that Qing cut off relations with Ryukyu as well. Thus Japan tried everything to make Ryukyu look as independent and autonomous as possible as China continuously sent in average about every twenty years an envoy to the Ryukyuan court to confirm investitures and tribunal connections (there were 22 such missions from 1404 to 1866). By the way, it has to be mentioned that it took the court several years to prepare to receive a Chinese missions as the envoys generally stayed for four to eight months. Often the money had to be borrowed from Satsuma to cover the enormous expenses of accomodating and entertaining the ambassadors and their entourage. To keep up appearances, Japanese were prohibited from visiting Ryukyu without shogunal permission, and the Ryukyuans were forbidden from adopting Japanese names, clothes, or customs. They were even forbidden from divulging their knowledge of the Japanese language during their occasional trips to Edo as part of Satsuma’s sankin-kôtai attendance. Apart from that, the Satsuma officials relocated temporarily from their residences or suspicious Chinese officials were taken to a different village to be shown that there were no Japanese. On the other hand, the Shimazu did not only profit from the trade loophole. A “side effect” of the attempt to make Ryukyu look as exotic and non-Japanese as possible allowed the clan to brag that they are ruling the one and only fief of Japan to which another kingdom is tributary! Not to mention the exotic goods they received first and long before anyone else via the Ryukyuan trade ships. In this sense I hope I was able to provide an interesting insight into a topic which is, as mentioned at the beginning, often left-out when it comes to the history of nihontô. 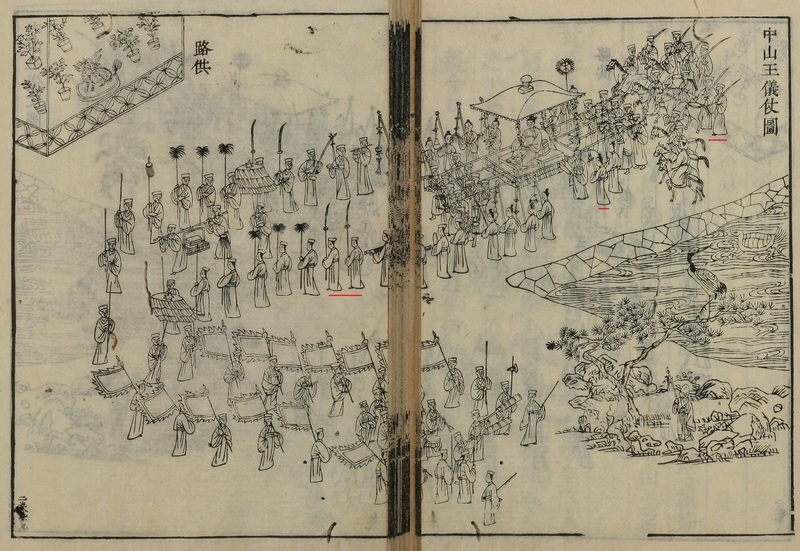 Picture 6: Depiction of the entourage of the Rykyuan King as seen in the Zhongshan Chúanxìn Lù (中山伝信録), the six-volume account of Ryukyuan history, politics, topography, language, and customs written by a Chinese official based on his journey to Ryukyu in 1719. On this depiction we see (highlighted in red) that at least in parades and official royal ceremonies, swords were worn. For example some wearing what seems Chinese-style naginta and some wearing drawn long swords leaning on their shoulders. And interesting is that the servant highlighted in red who stands next to the litter seems to hold the Chiyoganemaru sword. Dear Markus, I am running a blog on Ryukyuan Bugei and noted on these three swords in my “Karate 1.0” (2013). Thank you for the description and the details, which I believe, was the first time in detail in any Western language. The photos are incredible and your find of the servant holding the Chiyoganemaru in the “Zhongshan Chúanxìn Lù” print is amazing!!!! Is there any chance you would allow me to cite your article and use your pictures in a short article for my colleagues on my blog? Would use my own text, so it would be “only” the pictures. No problem, please feel free to use the pics. Would be nice if you could add a small reference to my blog somewhere in the article. Thank you and I am happy that this article gains so much interest! Thanks a lot Markus! Of course I will give credit. Do you have anything/any resources on Ryukyuan armor?